By using our Mobile Documentation App, your employees will always have access to the most recent version of the documentation. Our documentation online App will disclose the information required, be it scanned documentation or in original digital format. Have you ever experienced not being able to find a manual or not being sure if you are using the latest version? Now is the time to switch to a tablet or smartphone to disclose your documentation. Your organization will save time and costs in searching for a hardcopy document and save storage costs of the hardcopy archive. The Mobile solution consists of a Mobile App, a database (located at the central server) and interface scripts between the App and the Database. The Mobile App is available for all kind of mobile devices (SmartPhones and Tablets) and Operating Systems (iOS, Android, Windows etc.).. A taxonomy structure containing all your required documents. Both PDF, Word documents and Plain text versions of documents in the database. Plain text versions save your organization costly data transfers when you choose to open this small size document. 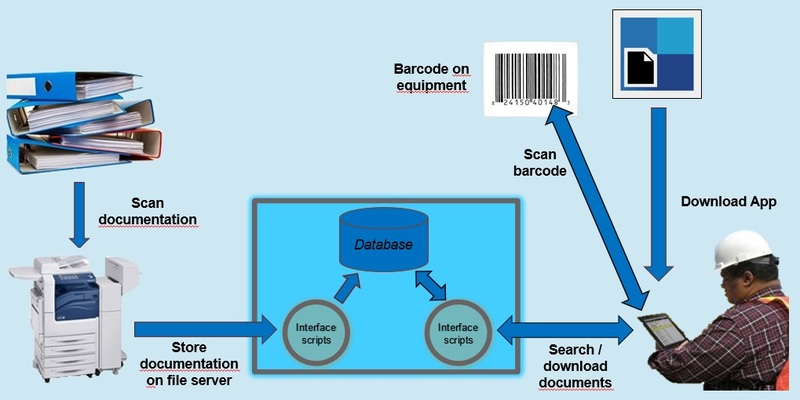 Opening documents or folders by scanning a related barcode tag. The Mobile App can also be opened from a Web Browser. MOBIS-ICT is able to digitize all your required documentation and import into the central database. The solution can easily be integrated within your existing application landscape. We deliver a standard database but the Mobile App can also be connected to your existing database that is already in use by your company to register the inspection and audit results. In the absence of an internet connection (like a vessel) it is also possible to install a local server with a copy of your documentation and database on site. The App will connect the server by a WiFi LAN. With our Mobile Inspection Solutions you can speed up your inspection process, improve the reliability of your inspection results and make these results immediately available to the management. Based on this information the management can anticipate and take corrective actions. MOBIS ICT can also deliver full tailor made Mobile Solution solutions for any kind of sectors like Oil & Gas, Maritime, Renawables, Transport and Infrastructure companies.